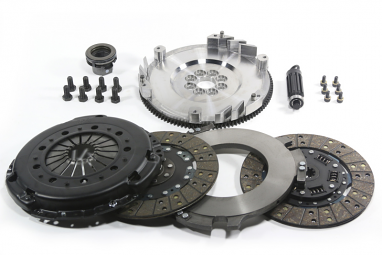 The MS Twin Disc Clutch Kit is designed to hold 100 to 200% more torque capacity to the wheels with sprung organic discs. The two organic disc setup provides additional contact surface area for higher torque capacity and longer lifecycle. Each kit is comprised of a pressure plate, organic discs and steel flywheel. Additional parts such as pilot bearing/bushing, throw-out bearing (are included when applicable) and alignment tool are also included.